Are you registered to vote for the November election? If you are not, it is suggested to register at least 30 days prior to the November 7th election. Resilience is a powerful documentary by James Redford and Karen Pritzker, illustrating the impacts of chronic stress on children’s brains. This one-hour movie chronicles the promising beginnings of a national movement to prevent childhood trauma, treat toxic stress, and greatly improve the health of future generations. Following the movie, there will be a discussion of the work being done in our schools and community to build resilience and counteract the impact of stress. For additional information on Resilience, visit http://kpjrfilms.co/resilience. When: November 9th, 6:30 to 8:30 p.m.
High School students and adults are invited to attend the "Build Your Future" workshop, where patrons can speak with college and business representatives, hear about different career plans and certificate programs, learn different ways to pay for college, apply and submit a FAFSA, and high school students can clear a "U" by attending. For more information go to www.tooeleschools.org/apps/pages/buildyourfuture. The Tooele County Board of Education is proposing to increase the voted local levy an additional .001 per dollar of the taxable value of the taxable property within the District. 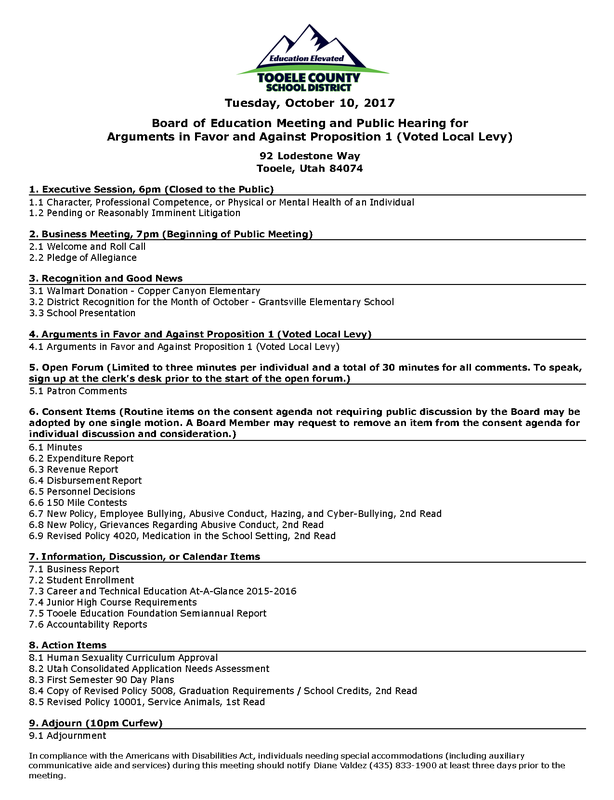 In 1998, the public voted in favor of allowing the District to levy a voted local levy of .0006 where it has remained since. If the proposed increase of .001 passes by the majority of voters this November it would allow the District to levy up to .0016 in the voted local levy. Tooele County School District students and families gathered together at Tooele Junior High August 5th for the eighth annual Back-To-School Closet. Students received new clothing, shoes and backpacks to prepare for the new school year. More than 1,200 backpacks were handed out this year. Multiple families also received eye exams and glasses through the Mobile Eye Care 4 Kids, a nonprofit organization that brings eye care services to children in need. Each year Tooele County School District employees are welcomed back for the upcoming school year with "District Opening." TCSD is excited to announce "Freedom Writers" Erin Gruwell as the keynote speaker for the annual kick-off event. Tooele County School District and community partners look forward to hosting the annual Back-To-School Closet. Last year approximately 400 families were in attendance. Students are able to receive clothing, shoes, backpacks, school supplies, and more. I excited to start this new year @ Wendover High School!